Union Public Services Commission (UPSC) has announced the results of Engineering Services Examination 2018 Prelims (ESE 2018 Prelims) exam. The ESE 2018 Prelims exam was conducted by UPSC on 07 January, 2018 to fill around 588 engineering positions in various departments of the Central Government of India. Candidates who have applied for Graduate Aptitude Test in Engineering 2018 (GATE 2018) through GATE Online Application Processing System (GOAPS), can check the response sheet of GATE 2018 for both the sessions i.e. forenoon and afternoon session (9 am to 12 pm and 2 pm to 5 pm). 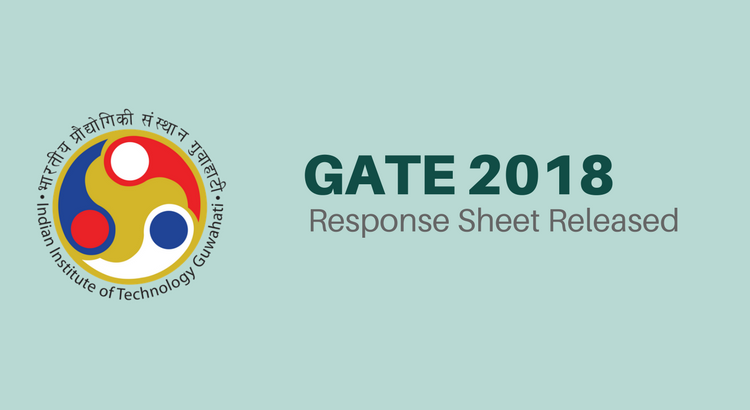 IIT Guwahati, the GATE 2018 exam conducting body, has released the GATE 2018 response sheet of all the candidates who wrote GATE 2018 on February 03, 04, 10 & 11, 2018. Candidates can check the response sheets for GATE 2018 by logging into their GOAPS portal. 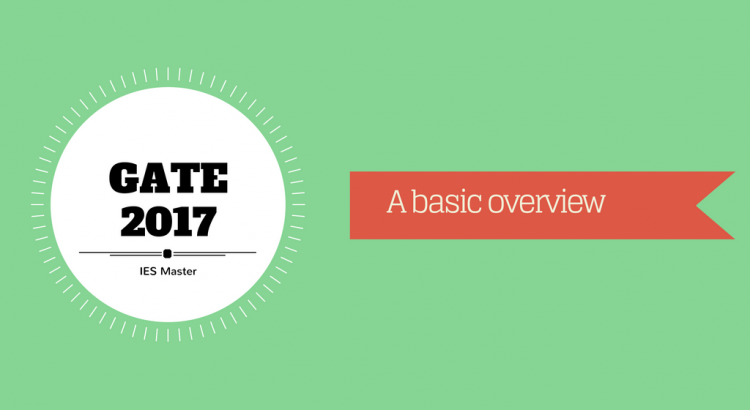 ESE-2017 Prelims Questions: How close was IES Master to the actual question paper? 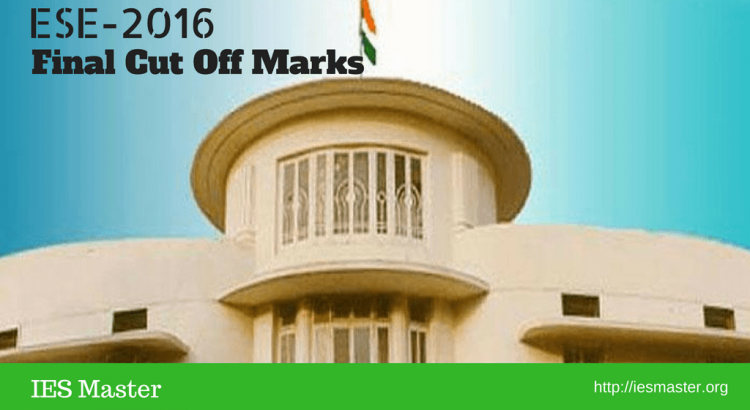 UPSC has released the final cut-off list for Engineering Services Examination 2016. Check out the objective stage, written stage and final stage cut-off marks for General, OBC, SC, ST, and Physically Handicap categories in Civil Engineering, Mechanical Engineering, Electrical Engineering and Electronics and Telecommunication Engineering. It’s celebration time here at IES Master, as the First Rank in ESE 2016, Mechanical branch (ME) is also from our institute. Mohd. 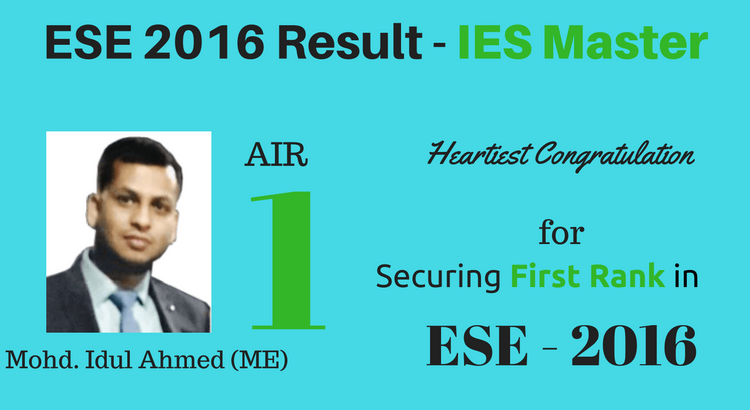 Idul Ahmed has secured 1st rank in ESE 2016, Mechanical Engineering branch. It doesn’t stop here. We have three students in the top 10 ranking. This is indeed a stellar performance. Taking core branches in consideration, no other institute matches our strike rate, all thanks to our commitment to the students. 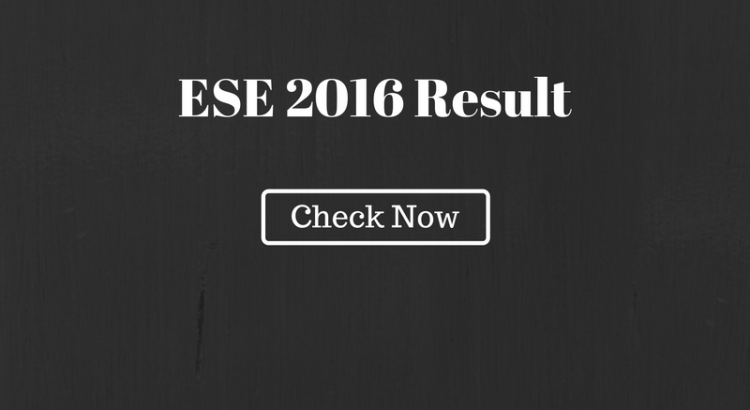 ESE Result 2016 – Result of ESE/IES 2016 conducted by UPSC (Union Public Service Commission) on 27 May 2016 has declared on 29 Nov, 2016. Students can check their result by downloading the PDF file attached below or on the official website of UPSC. UPSC Engineering Service Examination 2016 result is released in two steps. In first step, UPSC published the ESE 2016 written examination result. Students who cleared the ESE/IES 2016 written examination could appear in Personality Test or Interview. Job opportunities across private sector and government sector has grown over past decade, but the years of slowdown in world economy starting 2008 with US subprime crises has left bitter taste with many who opted for private sector jobs then. 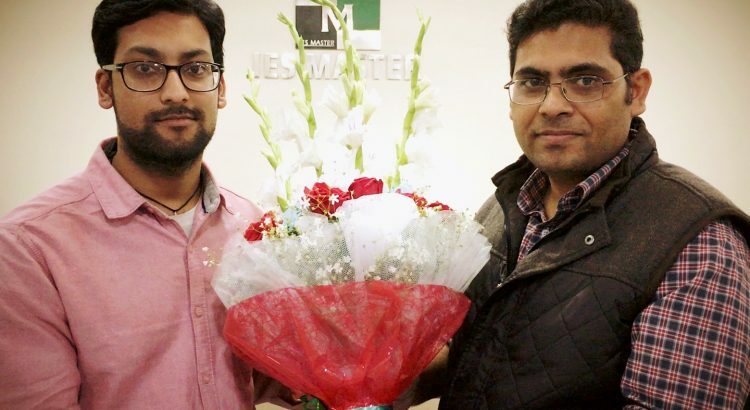 Not only did they compromised with their branch but were forced to compromise with salary at a later date. However, the realisation especially with IITians was a tad late. Out of touch with their branch for years, they started preparing afresh for government jobs. The salary packages offered by private companies have remained static, now for over a decade. This fact also gets reviled in the exponential rise in the number of students aspiring for GATE, which stood at 8,18,850 in 2016. But the travesty is in the number of students who were unable to secure even the minimum required cut off to get a valid GATE score, which close to 7 lakh. This reveals two things: You cannot clear GATE by fluke or by virtue of being a student of some premier college; second: guidance, clubbed with focused books by institutes like IES Master are big game changer. As of now 52 PSUs are recruiting through GATE but another 42 are in likely to consider GATE scorecard in near future. In fact GATE scorecard is turning out to be a quality benchmark and it’s hard to imagine that in coming days if private sector companies can avoid the temptation of not asking for it. GATE is much more than just a window to another job. It gives you a chance to live your branch. You grow with your branch. Your work becomes primary and money just a by-product. In short you are out of rat race. Gate is primarily a college based exam. While syllabus for GATE is not as exhaustive as ESE, but it does not give chance to commit unforced errors. Of 65 questions, 45 are technical or out of 100 marks, 70 marks are of technical. But, when clubbed with negative marking, there is no room for error. 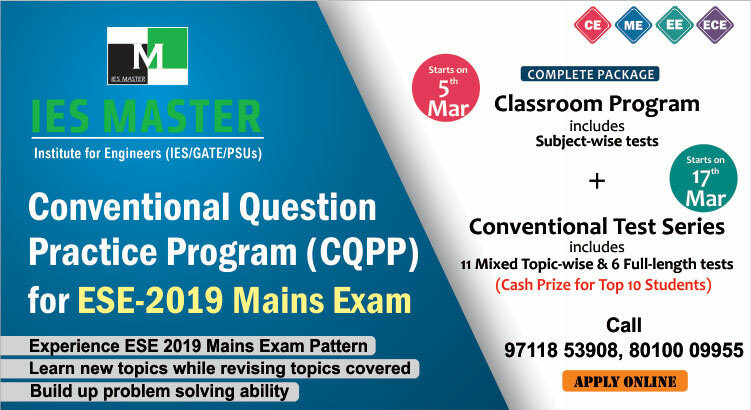 This makes GATE very unpredictable for those who have not revised well, or have not taken test and applied as numerical questions as possible. Three hours, sixty five questions: the time is more than sufficient as questions are asked on exact topics. Here the past year papers should be thoroughly rehearsed. For GATE six months preparation is more than sufficient. 80% of syllabus is covered until third year. Fourth year is the best time to clear GATE. Interestingly, getting a GATE score is not an end to journey. Getting into right PSU, IIT or research program requires good score, as well as understanding the recruitment process of particular PSU you are aspiring for. IES Master provides complete counselling for such students. In some PSUs you have to apply before GATE exam and submit GATE admit card. Subsequent to the exam you have to upload marks. However, in maximum PSUs you have to apply only after GATE results. GATE exam is held in first two weeks of February, whereas ESE Prelim is scheduled to be held on 8th January this year. The gap is somewhere around twenty five days. Comprehending first ESE syllabus and then GATE syllabus is indeed little tricky for final year student. So if you have comprehended syllabus really well, go for ESE, else it is advisable to go for GATE. 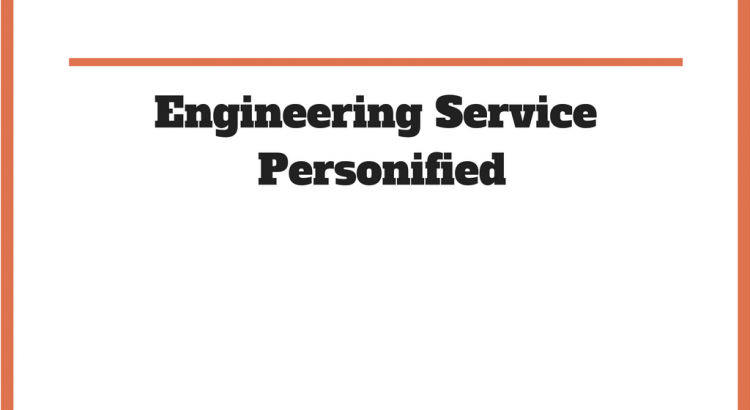 Engineering services are at the crossroads. While old pattern has been done away with, the new pattern awaits the verdict, next year when the results are out. But one thing is evident, ESE is becoming more specialised. Engineer students preparing for half a dozen exams, including IAS, SSC and various state services exams have been blunted. The call of UPSC is for focused candidates, who are willing to be part of change, for the nation tomorrow. As of now, conventional questions as well as objective questions are asked in the ESE, which makes it very lengthy. Time is always short. However, going the current mood of UPSC, ESE is going to become even more demanding on time and energy. It is here that structured approach and guidance takes the centre stage. 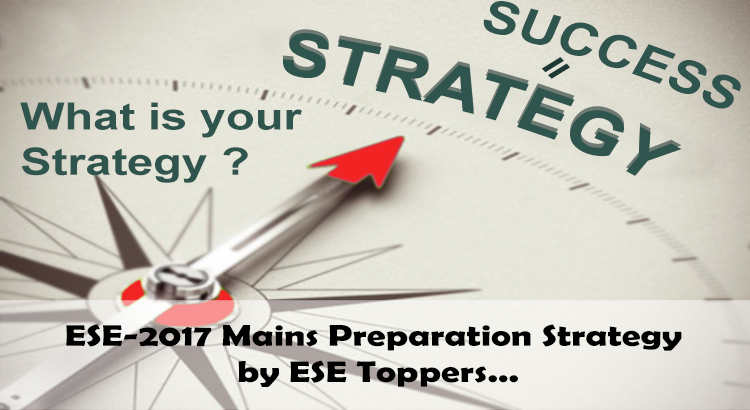 IES Master has already made a mark in decoding the strategy for new pattern of ESE. Starting with topic wise focused exam books to special GS batches, IES Master has ceased the opportunity for students appearing in 2017 exam. The pioneering innovative has also been done at every single stage in classroom programs, keeping in mind the heightened requirements of the exam. ESE is all about speed and accuracy. So adequate number of tests have been made available. In fact 2017 ESE is turning out to be a big leveller. Armed with quality IES Master Publication books and classroom guidance, students of private college are at par with the students from IITs. Under the new ESE exam pattern, prelims would be conducted in the month of January. In about four month’s time it’s mains. In next two months i.e. by July results would be out and interviews would be held in August. Final results would most probably be out in the month of September. Sustained motivation is required because the duration of exam is very long. It is for this reason serious student, preparing for whole year prefer ESE over GATE. Going by the current trend, second attempt is the best chance of securing a rank in ESE.